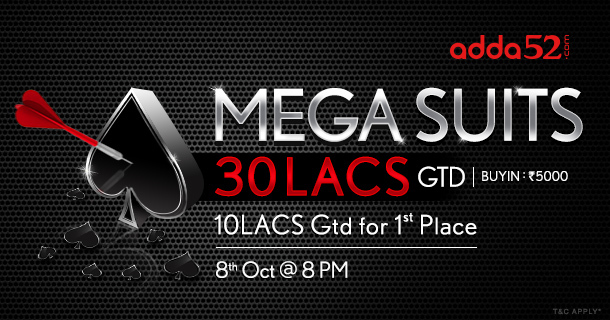 In its effort towards upping the ante of the rapidly growing poker industry, India’s largest poker site-Adda52.com announces a brand new exciting tournament- Mega Suits, which takes place on 8th October at 8 PM next month and guarantees a hefty INR 30 Lac GTD and INR 10 Lac GTD for the winner. All other players who finish in the money will receive their share as per the prizepool formed. Designed and structured by some of the biggest and brightest poker minds in the country, the newly announced tourney Mega Suits promises to be a game changer for any poker player with a whopping prize money up for grab. What is more, the winner of this tourney gets a ticket to 55K WPT India Main Event to be held in Goa from 10th to 13th November 2017. Now that is something players must be looking for in an online tournament! To the delight of the poker players, Adda52.com is hosting daily satellites, giving poker players a chance to win themselves a seat into prestigious event Mega Suits for as low as INR 500. The online satellites have already kicked off today and will be running till Sunday, 8th October next month. For the additional details of the tournament and online satellites, feel free to visit this link HERE!